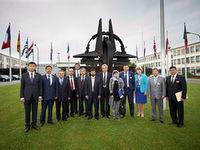 A group of 14 parliamentarians from Afghanistan, Kazakhstan, Kyrgyzstan and Tajikistan visited NATO Headquarters in Brussels, Belgium. The visit - organised by NATO Public Diplomacy Division - was part of a long-standing programme of cooperation in the field of public diplomacy between the Alliance and these countries. The group met with representatives of the Diplomatic Corps, as well as with members of the International Staff, including Ambassador Dirk Brengelmann, Assistant Secretary General for Political Affairs and Security Policy. The visitors exchanged views on a range of topics, including NATO's Strategic Concept, the recent NATO Summit in Chicago, Afghanistan and the consolidation of NATO's partnerships with Afghanistan and the Central Asian Republics. "The Chicago Summit was a very important marking point,” said Mr.Mirdad Nejrab, Chairman of the Internal Affairs Committee of the Afghan Lower House. “We welcomed the decisions undertaken in that venue to support the consolidation of lasting security in Afghanistan. We are determined to stay the course, with NATO assistance," he continued. Ambassador Brengelmann thanked the representatives of Kazakhstan, Kyrgyzstan and Tajikistan for the progress made on transit arrangements in support of the NATO-led engagement in Afghanistan and emphasised NATO's ongoing commitment to Afghanistan, "throughout the end of 2014 and beyond". He also remarked on the importance that NATO attributes to further developing partnership arrangements with all the countries represented within the visiting delegation, again stressing that such partnerships are "compatible and complementary with other partner arrangements developed by these countries". The visit provided also an opportunity for Tajik parliamentarians to share their views in the context of the celebrations for the 15th anniversary of the general agreement on the establishment of peace and national reconciliation in Tajikistan. On 7 July, the group visited SHAPE, where they met General Lange, SHAPE Chief of Staff and other officials. In Brussels, the group also met with Mr David Hobbs, Secretary General of the NATO Parliamentary Assembly. The meeting provided an opportunity to exchange views on ways for Afghan, Kazakh, Kyrgyz and Tajik parliamentarians to reinforce collaboration with the NATO Parliamentary Assembly.